The Phoenix roebelenii or pygmy date palm is a slow-growing palm tree popular for residential landscapes. This palm is one of the more attractive dwarf palms, growing only between 6 and 12 feet tall. Commonly used as a container plant, the pygmy date palm will give a tropical look to any patio or pool area. The palm produces small dates that are a deep red when ripe. Pygmy date palms are hardy in USDA zones 10 and 11 and will grow in partial shade to full sun. Palms are low-maintenance trees. Water the tree every day for the first two weeks after planting. Slow, deep watering is best within 2 feet of the trunk the first two months, then gradually irrigate farther away from the trunk to ensure the roots grow outward. For the rest of the season the palm should be watered deeply, to a depth of 2 feet, once a week. Once the tree is established, irrigate every other week unless it is very hot and dry. Apply a fertilizer made specifically for palm trees. Palm trees have very specific nutrient needs that these fertilizers provide. Refer to manufacturer’s directions on the amount to use for the size and age of the palm. Spread a 3-inch layer of mulch in a 3-foot diameter around the tree, keeping it at least 3 inches away from the trunk. This will keep the weeds from growing, retain moisture and keep the roots cooler when it gets very hot. Prune only the brown, dead fronds. 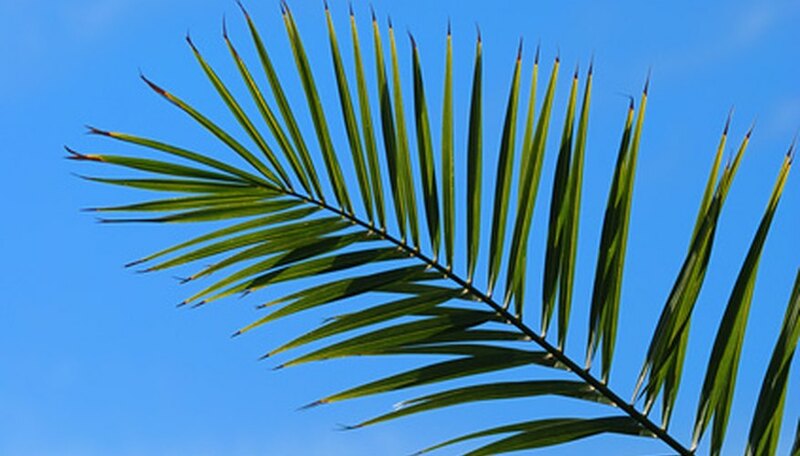 Palm fronds gather nutrients for the tree and if cut off too soon will cause the tree to be unhealthy. If too many fronds are removed prematurely the crown will rot and the tree will die. Never use nails or spikes in the tree or hit the tree with a weed remover. These types of injuries to the tree allow diseases to enter the tree and cause its eventual death. What Is the Growth Rate for Majesty Palm Trees?